Jajang(590~658) in the first year of Queen Jindeok (647-654), 28th ruler during the Silla Dynasty. 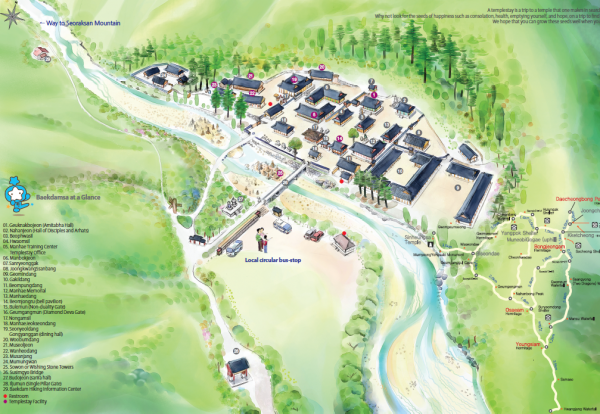 Then, it was renamed Baekdamsa, meaning “100th Pond Temple,” because it was built on the 100th pond of many ponds along the valley of Daecheongbong Peak of Seoraksan Mountain. The most famous monk of Baekdamsa Temple is Manhae (pen name) Yongun Han (1879-1944). He represented the thirty-three activities and declared the country’s independence during the March 1st Independence Movement of 1919 resisting the Japanese Occupation. Here, he shaved his head and took his ordination in 1905. He also published a book of poems, Nimui Chimmuk, or The Silence of the Holy Man, as a protest against Japanese’s invasion and pillage, in addition to leading the innovation of Buddhism. The hall was dedicated to Amitabha Buddha, the lord of the Buddhist Pure Land of the West. Amitabha Buddha is attended by Gwansaeeum, or Avalokiteshvara Bodhisattva, who leads all beings to the pure land, as well as Daeseji, or Mahasthamaprapta Bodhisattva of the Great Power of Wisdom. Gwansaeeum Bodhisattva is the symbol of compassion and saves all being from afflictions and suffering, and Daeseji Bodhisattva symbolizes wisdom. He lights up all beings, giving them endless energy. Here, a yebul or prayer chant takes place every morning and evening. 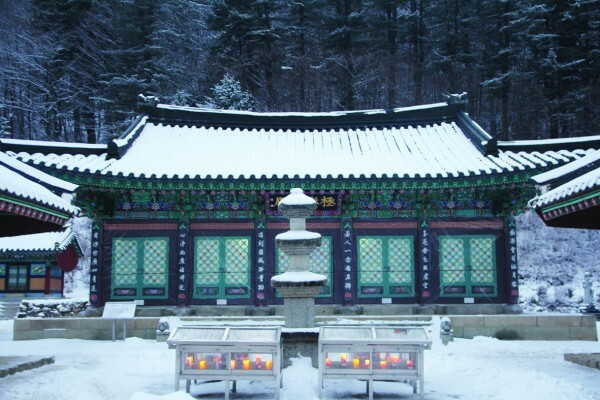 The hermitage is a part of Baekdamsa Temple, and is located at the highest point of Seoraksan Mountain. 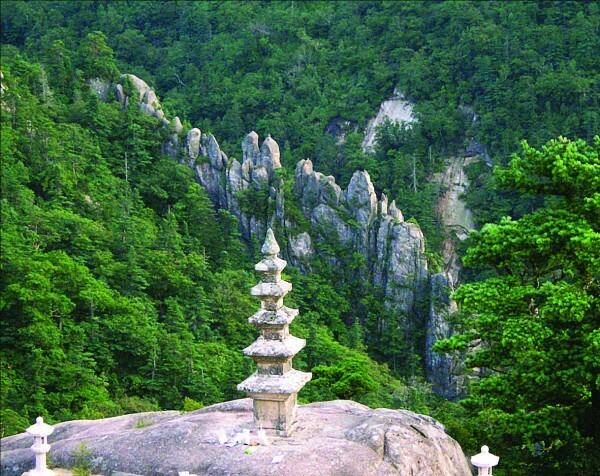 This stone sarira pagoda rests on top of a massive rock wall on the right of Bongjeongam Hermitage. It is said that Precept Master Jajang(590~658) of the first year of Queen Jindeok (647-654), 28th ruler during the Silla Dynasty, enshrined Buddha’s sarira by building the pagoda here. This is one of the five places where Shakyamuni Buddha’s sarira were placed in Korea. Thus, it is the most-visited place for believers reciting an endless prayer. 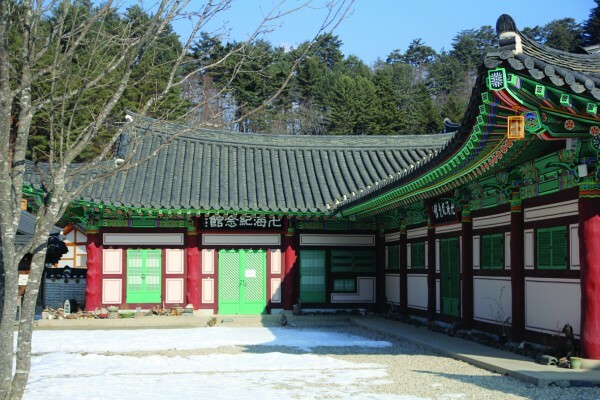 It takes six hours to walk from Baekdamsa Temple to Bongjeongam Hermitage (11km). He was born in 1879 in Hongseong, Chungcheongnamdo Province. In 1905, here at Baekdamsa, he took his ordination under Venerable Yeongok. His dharma name was Gonghwan, his precept name was Yongun, and took Manhae as his pen name. In the March 1st Independence Movement of 1919 against the Japanese invasion, he represented the thirty-three activities and declared the country’s independence. Because of that, he was imprisoned for three years, whereas others had turned pro-Japanese. Even afterwards, he kept his faith and worked towards the freedom of his country and innovation of Buddhism until the end. Manhae’s most famous work is a poetry book Nimui Chimmuk, or The Silence of the Holy One, along with many other writings. Over 800 of his articles are exhibited at Manhae Memorial, in the hopes of keeping his spirit alive. What is “Buldo” or “Buddha’s way”? Why not take a break to drink some tea here? The walls of the tea house divide in and out. Who is in, and who is out? There is another universe in the tea house. 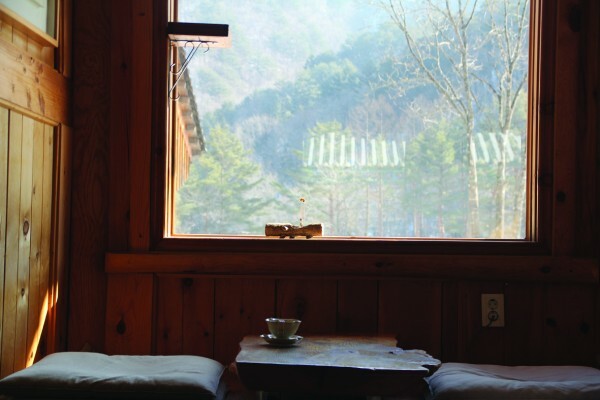 Enjoy the peacefulness of having tea, moving inside and outside of the border. 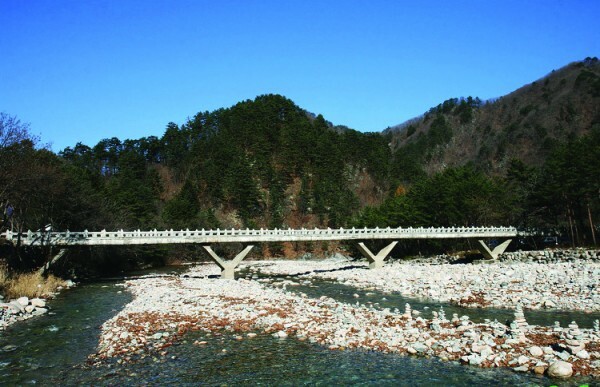 You may come across the unique scene of wishing stone towers in the valley beneath Susimgyo(修心橋) Bridge on the way to Baekdamsa Temple. In rainy season of summer, these towers get washed away, yet more towers spring up. They are a famous part of the landscape of Baekdamsa. The snowy mountain of Seorak, seen from Susimgyo, reminds you of lotus buds. The stone towers look like stamens. It is said that these can only be seen by people with a pure heart.